First came steam. Then electricity. Then computing. Over the last three centuries, the world has been transformed by a series of technological advances. Today, we’re diving ever deeper into the Fourth Industrial Revolution. This newest revolution is being driven by AI and connectivity. And like those that have gone before, it’s changing everything – not least the perspectives of financial service organisations, and the context in which they operate. The Fourth Industrial Revolution has cracked open this once-impenetrable market, allowing a flood of new competition. But as we know from working with our financial services customers, this can be a really positive development – whether you’re a start-up or an established household name. A slew of start-ups are challenging more established players by carving out their own specialised niches in the financial services industry. Service specialism – companies that differentiate by offering a single service like tax advice, insurance, investment or wealth management. Approach specialism – companies that differentiate on a new tech (e.g. apps) or a new model like ethical investment. Of course these companies start small, but they don’t necessarily stay that way. Take our customer Funding Options – they officially started in 2011, but didn’t really get going on their current model until 2015. Now their Marketing Director, Richard Leader, proudly calls them “the UK’s premier online business finance marketplace, finding millions of pounds of finance for hundreds of customers every month”. That’s a pretty impressive turnaround time. In the past, Financial Services newcomers and established players have traditionally seen themselves as fierce competitors. But with connectivity driving this Fourth Industrial Revolution, becoming strategic partners is an increasingly attractive option – and in many cases, companies have a lot to gain from working together. For example, we’re seeing more and more partnerships that combine one company’s expertise with another’s established market reach. Equally, when creating new products, enterprise players are increasingly able to take advantage of younger companies’ UX and app design know-how. The younger company, meanwhile, gets valuable brand recognition and business dev support. Through such strategic partnerships, everybody wins – newcomers benefit from scale and experience of the established players, while older, larger companies benefit from the innovation and agility of a true digital-native organisation. Customer service expectations have risen in every industry, to the point where delivering personalisation, convenience, and trust is fast becoming table stakes. And whenever new disruptors – not least FinTech start-ups – raise the experience bar, they raise it for everyone. The only way to deliver a personalised, super-convenient and trusted service is to have a full understanding of your customers. Traditionally, this was impossible – data was too siloed, and processes too manual. But now, in the smart, connected age of the Fourth Industrial Revolution, a 360-degree customer view is no longer a pipe dream. It’s a functioning reality for many Financial Services organisations and – for those who looking to lead in customer engagement and experience – a must-have. When we stop siloing customers and see them as complete people, it’s not just good news for the customer. It unlocks a lot of potential for the business too. Better conversations. Improved customer experience. More opportunities. 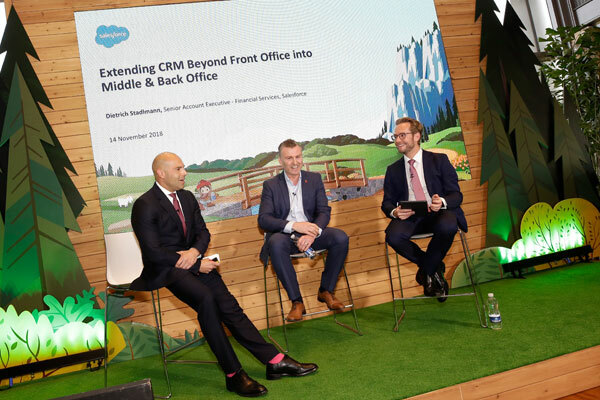 At Salesforce, we saw the impact of this fundamental shift early on – through our close relationships with our FinServ customers. The Fourth Industrial Revolution is shaking the Financial Services industry to its foundations. But it’s also giving organisations with an appetite for change the technologies and partnership opportunities they need to rebuild – creating services that surpass even today’s skyrocketing customer expectations. Find out how some FinServ trailblazers are already doing it with the help of Salesforce Financial Services Cloud.